Numerous insects have stings as their protective weapons and can bite or sting people to protect themselves. Some of the bites and stings do not even hurt while some can cause quite a serious amount of pain and, for those allergic to certain kind of insect sting, it can present a life threat. Many people consider hornets to be insects with a most painful sting. What is interesting about hornets is that they, when compared to bees who can sting only once and then die since their sting is connected to the vital organs in their body, can sting more than once. They don't have that kind of constraint as bees and, on the contrary, hornets can, on each sting, insert more venom into the body of the person stung, making the effect more serious. Hornet's sting creates irritation and small swelling around the entrance spot. It hurts and itches but for a person who is not allergic it presents no life threat or a significant danger. However, if a person is allergic to hornet stings, only one sting may be enough to cause a coma or even death. 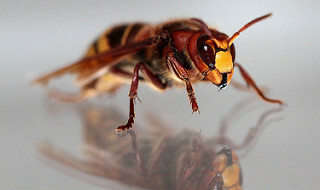 When it comes to treating a wound made by a hornet's bite, one should firstly check if, although this rarely happens, a piece of the stinger has been left in the skin and remove it. Secondly, disinfection of the wound takes place. For this, mere water and soap can be used to remove any bacteria and clean the wound. Meat tenderizer is known to possess substances which can dissolve insect venom, so it is a good thing to be applied on the wound as well. Afterwards, take an ice pack or put ice cubes in a cloth and apply it to the wound in equal frequencies and lengths, optimal being 10 minutes. Anti-histamine is good when removing the itching around and on the wound, so capsules or cream can be used for this purpose. In case of abrupt infection and failure of reducing the swelling, consult your doctor. People with allergic reactions should be careful when being stung and notice if any dangerous side effects like breathing difficulties, throat or face swelling, fatigue or rash appears afterwards. If so, they should search for medical help immediately since the outcome may involve death itself. Also, more experienced people who are allergic to hornet or any insect's sting may have epinephrine emergency medication with them and use it to prevent any allergic reaction in these cases.